The human epidermal growth factor receptor 2 gene (HER2) is amplified in approximately 15% to 20% of primary breast cancers. The amplification of the HER2 gene is traditionally been associated with a poor prognosis. Adjuvant trastuzumab given during and/or after chemotherapy to women with early-stage breast cancer with evidence of HER2 overexpression, results in a significant improvement in disease free survival and overall survival. HER2 overexpression is well established as a strong predictive marker for clinical benefit from trastuzumab (Herceptin, Genentech, South San Francisco, CA, USA) in both the metastatic and adjuvant settings. Lapatinib, pertuzumab and ado-trastuzumab emtansine, are newer HER2-targeted drugs that have been approved for the treatment of HER2-positive metastatic breast cancer. However, current data shows that lapatinib (when added to paclitaxel) and pertuzumab as a single agent offer no clinical benefit in patients with HER2-negative metastatic disease. In addition these are more expensive and may be associated with dose-limiting toxicities. 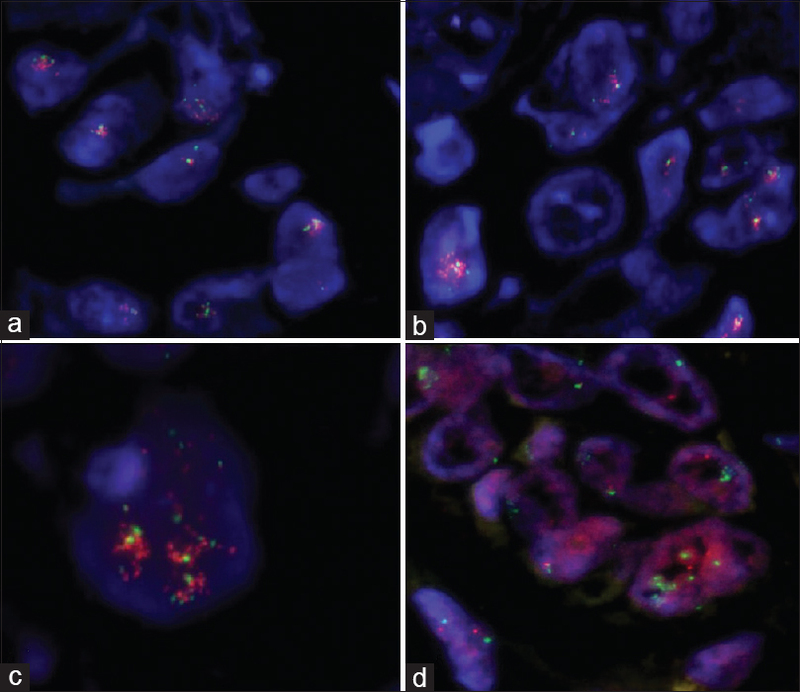 Fluorescence in situ hybridization (FISH) is considered as the gold standard for determining the amplification status of HER2 gene, which uses a combination of fluorescently labelled probes for centromeric region of chromosome 17 (CEP 17), as a control probe along with a probe for labelling the HER2 gene on chromosome 17. A HER2 signal count to CEP 17 ratio, assessed in at least 20 cells, of more than 2 or an average HER2 copy number of > 6.0 signals/cell is considered HER2 amplified. In a small subset of cases, unusual FISH patterns exists which pose interpretative challenges. We present here two cases of invasive duct carcinoma, grade II in the first case and grade III in the second case, negative for expressions of both estrogen (ER) and progesterone receptors (PR), while their Her2 by immunohistochemistry was 2+. The cases were reviewed by two pathologists independently for FISH. FISH was performed using PathVysion HER2 DNA Probe Kit II from Vysis, Abbott molecular, Des Plaines, IL. Both the cases showed multiple signals for CEP 17 (green colour) and HER2 (red colour) many of which were co - localised resulting in yellow signals. In both the cases it was difficult to individually count the exact number of each signals [Figure 1]a,[Figure 1]b,[Figure 1]c. As the copy number of HER2 in both the cases was more than 6, both cases were reported as amplified. To differentiate this signal pattern from a possible polysomy of chromosome 17, we performed FISH on both the biopsy specimen using Vysis TP53/CEP 17 FISH Probe Kit, Abbott molecular, Des Plaines, IL, which uses spectrum green fluorochrome to label the alpha satellite DNA material at the centromeric region of chromosome 17 (CEP 17) while the spectrum orange fluorochrome labels TP53 gene located at 17p13.1. In a typical case of polysomy for chromosome 17 the expected signal pattern would be increased green as well as red signals which would be equal to the number of copies of chromosome 17 while in a normal cell the expected pattern would be two green and two red signals indicating disomy. The FISH on the two biopsy specimens with Vysis TP53/CEP 17 FISH Probe Kit showed presence of only two red signals indicating the presence of two normal copies of TP53 gene. However, there were multiple green signal [Figure 1]d which confirmed amplification of the centromeric region of chromosome 17 rather than polysomy. In a review of 1,788 cases of HER2 FISH by Pai T et al. and 1,787 cases by Starczynski J. et al., only 2 cases (0.1%) each showed co-amplification and co-localization of CEP17 and HER2 signals., Starczynski J. et al. proposed that extension of HER2 amplicons towards centromere and incorporating part of pericentromeric region resulted in such co-localization. They suggested that such cases should be reported as amplified for HER2. In a study of 8,068 cases, Ballarad M, classified HER2 cases as 'classic amplified', 'classic non amplified' and 'non-classical amplified' categories depending upon the HER2/CEP17 ratio and copy number of HER2 and CEP17. A 0.8% of all the cases had co-amplification of HER2 and CEP17 and were classified as 'non-classical amplified' along with other cases with non-classical signal patterns. None of their cases in 'non-classical amplified' had a pattern observed in our cases; however, our cases would probably fall into this same category. They also found that these 'non-classical amplified' cases had a higher frequency of ER positivity as compared to 'classical amplified' cases; however, sub group of cases with co-amplified HER2 and CEP17 had relatively lower frequencies of ER positivity, 3+ on immunohistochemistry and higher tumour grade as compared to other cases with non-classical signal patterns. In the present cases, ER and PR were negative; while HER2 was 2+ by IHC. First case had grade II tumour, whereas it was grade III in the second case. Further, there is limited data for the efficacy of trastuzumab in patients with 'non-classical amplified' HER2 status especially without an overexpression of the HER2 protein by IHC., They suggested that correlation with other factors including pathologic features of the patient's cancer should be used in such setting when considering trastuzumab or HER2 targeted therapies. In our opinion as well, as the mean HER2 copy number is more than 6, such patients should be given an option for HER2-targeted therapies. The occurrence of co-amplification along with co-localization signal pattern of HER2 FISH is extremely rare and their therapeutic relevance currently unclear. Awareness of such a pattern is important in interpretation and reporting of HER2 FISH results and cumulative data along with follow-up would bring an insight into exact therapeutic impact. Starczynski J, Atkey N, Connelly Y, O'Grady T, Campbell FM, di Palma S, et al. HER2 gene amplification in breast cancer: A rogues' gallery of challenging diagnostic cases: UKNEQAS interpretation guidelines and research recommendations. Am J Clin Pathol 2012;137:595-605. Sauter G, Lee J, Bartlett JM, Slamon DJ, Press MF. Guidelines for human epidermal growth factor receptor 2 testing: Biologic and methodologic considerations. J Clin Oncol 2009;27:1323-33. Hurvitz SA, Dirix L, Kocsis J, Bianchi GV, Lu J, Vinholes J, et al. Phase II randomized study of trastuzumab emtansine versus trastuzumab plus docetaxel in patients with human epidermal growth factor receptor 2-positive metastatic breast cancer. J Clin Oncol 2013;31:1157-63. Pai T, Shetty O, Patil A, Shet T, Desai SB. Coamplification with colocalization of the human epidermal growth factor receptor 2 and centromeric-17 signals on fluorescence in situ hybridization in invasive breast carcinoma: An exceedingly rare finding. J Postgrad Med 2016;62:210-1. Ballard M, Jalikis F, Krings G, Schmidt RA, Chen YY, Rendi MH, et al. 'Non-classical' HER2 FISH results in breast cancer: A multi-institutional study. Mod Pathol 2017;30:227-35.